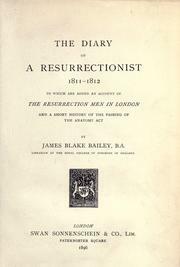 1 edition of The diary of a resurrectionist 1811-1812 found in the catalog. Add another edition? Are you sure you want to remove The diary of a resurrectionist 1811-1812 from your list? to which are added an account of the resurrection men in London & a short history of the passing of the anatomy act. Published 1896 by S. Sonnenschien & co., lim. in London . August 30, 2010 Edited by ImportBot Found a matching record from Internet Archive .